There is something delightful about custom-making a creation just for yourself. You see the piece in your mind and imagine the little touches you want it to have and picture where you will wear it or put it in your home. With each stitch, you know you are making a gift for yourself. You can sigh with less frustration when you have to undo mistakes you might make along the way. You can smile with that "oh it is perfect" smile when you put it on or place it where it belongs. 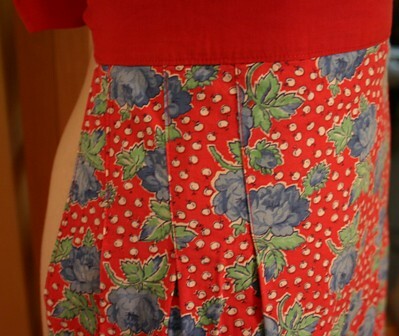 I wanted a skirt look, so I made it large enough to meet at my waist in the back. The front pocket closes with Velcro, so that it can hold my wallet or needlecase and seam ripper or change when it becomes my cashbox of sorts when I sell my creations at shows. I added the side pocket at just the right length to rest my hand inside it and to have access to whatever I might need. I have found it to be the perfect accessory when I run errands, especially when my hands are full. Like today when I needed to mail nine packages and fill out five custom forms and other things at the post office. Today, I find myself needing an afternoon break from a bit of work stress. And, lucky me, because I work from home, I can give myself this needed break. 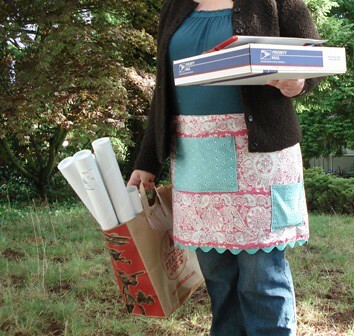 I think I am going to spend time in the little room creating a few more of these aprons to sell at ArtFiberFest (and speaking of AFF, when I went to Teesha's site to grab that link, I saw that a few spots are left. You, yes you, should take a break from all that has been crazy in your life and head to this neck of the woods to spend time with some of the most fantastic people you have ever met in one of the most beautiful spots in the world...and get to learn while making a few things too). 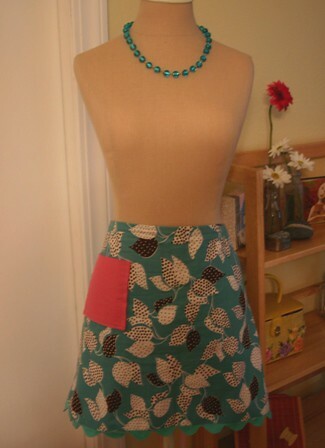 I think I'll tweak the pockets a bit to add some spots for tools the crafty+artsy person needs when creating. 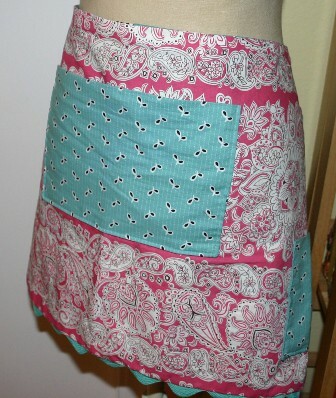 And, I am going to make these aprons in various sizes too because I do love that skirt look. And one more thing: Thank you so much for your kind comments on my Wednesday post. Thank you for reading my story, for understanding, and for filling me up with your words. Thank you.